Danger and fear is a probability. Pain and hardships are a given. By taking part in the 2010 Mongol Derby in August, "you are greatly increasing your risk of severe physical injury. You could break limbs, suffer internal injuries, become paralysed or even die," according to their website. So why then would a 39-year-old woman ("I have it on good authority that women do not have birthdays after 39...so I guess I am 39") want to take on the "toughest horse race on the planet," a 1000-km horse race across the wild Mongolian Steppe? Kat Swigart, of Fullerton, California, answers: "To meet the challenge. All aspects of it, as it is truely a unique challenge with all the facets to it: the riding challenge (which is but a small part of it), the physical fitness, the mental fitness, the planning and preparation - all of the things that led me to be a Boy Scout (literally, I have a membership card with my name on it for the Boy Scouts of America) in high school. I got my survival in the wilderness merit badge on a 9-day, point to point, backpacking trip in the Sierras when (not by intent) half-way through the trip a bear (or bears?) got all our food. The Mongol Derby is an excellent test of the Boy Scout motto of 'Be Prepared.' And there is also the fund-raising challenge to be met at the same time - which is not an irrelevant part of the challenge. This appeals to the MBA in me. "This but scratches the surface of the challenges I will be facing between now and the end of August. Tell me of another event that presents the same challenge/s....and maybe I will try that one next. Assuming I come back alive (not a guarantee, by any means)," from the Mongol Derby, she says. Without a marked trail over rough, sparsely inhabited terrain, being exposed to any kind of weather and temperatures, and with limited medical help in ready access, calling this horse race a "challenge" is an understatement. Riders will have 10 days to cover 1000 kilometers, riding (by map and GPS) to Urtuus (horse stations) approximately 40 km apart, mimicking the old postal system of Genghis Khan, where they will switch horses and continue on to the next Urtuu. Riders are limited to carrying 11 pounds (2 kg) of equipment with them on the horses, so they'll have to rely on local herding families at the Urtuus for food and drink. Additionally, to participate, riders are required to raise 1000 GB Pounds (about $1500) for a Mongolian charity to be announced. Last year's Mongol Derby, the inaugural running, was not without controversy. The perceived casualness of the organizers, The Adventurists, over the welfare of the 6-800 horses that were to participate, prompted concerns from outsiders, the result of which led to assurances that horse care was of primary importance. Veterinarians were on hand at the Urtuus to monitor horse welfare; and after the ride, organizers reported that less than 2% of the 700 horses that took part in 2009 required treatment, which was all minor first aid. It led to an innovative veterinary training program launched by the organisers of the Mongol Derby that will train more than 20 local veterinarians to ensure the welfare of the horses for this year's ride. While the horses should be well looked after, the riders are, well, sort of on their own, other than pre-race training for participants that will be provided by Maggie Pattinson, Chef d'Equipe for the British Endurance Squad. Since there is no marked course, riders will make their own ways to the horse stations. They'll carry an emergency beacon they can activate if there's an accident, but there's no guarantee help will be close. Getting lost, and getting ill from food and drink are Kat's two major concerns. Getting hurt is not. "I can get hurt anywhere; I would be a basket case if I spent my life worrying about getting hurt." She is hoping to refresh her orienteering skills enough between now and then so that getting lost won't be an issue, and she plans to bring along a small stove, "so I can cook the s*** out of everything I eat or drink." The idea of riding long distances over multiple days is not new to Kat. She's been riding endurance since 1991, and she's done a lot of multi-day rides. 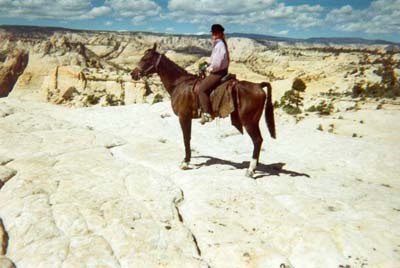 Her most rewarding and challenging ride so far has been the defunct Outlaw Trail in Utah, over remote and inaccessible trails that Butch Cassidy and the Hole in the Wall Gang used to escape pursuers. "Doing all 5 days of the Outlaw Trail on the same horse, my first endurance horse, was a choking up experience as I was approaching the finish line of the last day and thinking, 'I can believe we are really going to do this.' Incredible satisfaction. I confess, IF I finish it, I expect the emotion to be even greater from completing the Mongol Derby." It's probably the biggest challenge Kat has ever taken on, but, she says, "I really haven't given it that much consideration." It's not about how big the challenge is, and it's not about winning. It's about setting a goal, working toward completing it, and testing yourself. Kat Swigart puts her foot in the stirrup and heads forth into the Mongolian wilderness on a semi-wild Mongolian horse on August 7th. love your opening statements... short, sweet and right on!!! Best of luck to you Kat and safe travels.